We updated the Web App only for this release to make the scope of a new release doable in Q1 2016. Also, we can get your feedback on the updates and make any improvements or bug fixes brought in by the updates before releasing new versions of the Android and Windows apps. [F] Merge Logs. This is a subtle but huge new feature. You can import a Campaign Log JSON file into an existing Campaign log and all new entries will be appended. Why is this huge? We can all share Campaign Log files with each other now. 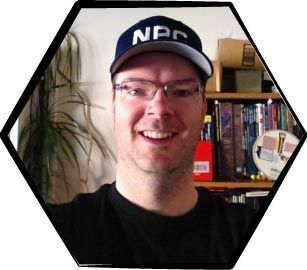 If I make an awesome encounter or cool names resource file, you can import into your Campaign Logs and use. It’s early days for this, and more news on support for customer file sharing to come. [F] Custom Tag labels. One of your most popular requests. You can now name your Tags anything you like to suit how to think and organize your campaigns. [F] Copy a Log entry. Sometimes you want to clone a Log entry to save typing. You can now copy a Log entry both within a Campaign Log and to any of your other Campaign Logs. This makes having different Campaign Logs for one campaign an easier option if you prefer. For example, I now have a planning Campaign Log and a session Campaign Log. I keep each open in a different tab and copy encounters and NPCs over from my planning log during sessions. [F] Prefix and Suffix text. Sometimes you want to write several Logs at a time (during a session, for example) and have a Tag or piece of tag be added to each Log entry. For example, I like to add the session number to all Log entries using the * Tag so I can easily list Logs per session in the future. 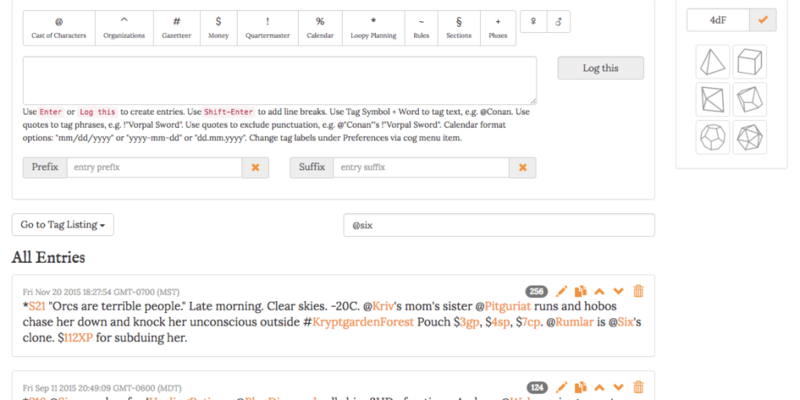 You can now add any text or Tags you like at the start or end of Logs automatically. [F] Village Generator. A quick and easy way to frame out villages and small towns for your fantasy or low-tech campaigns. Copy results in Log entries for easy future reference and world building. [F] Beta Dice Widget. Roll dice within the Logger. Supports Fudge die and multiple dice types and combinations. This is a beta test of adding widgets to the Campaign Logger. Feedback is welcome, as more widgets are planned for the future. [F] Two new Tag symbols. At your excellent suggestions, we added two more symbols (+ and §) to give you more Tag types to log with. On Mac, you can get a § symbol with OPTION+6. [F] Move Log entries. You can now reposition Log entries up or down in the list order. This was to help customers who requested “item 0” Log entries to store stat blocks and foundational information about Tagged items. Just move a Log Entry to the bottom so it’s becomes “item 0” in your lists. [E] Tag Autosuggest keyboard navigation. In the Web App you can use keyboard to go up and down the list that pops up, then hit TAB to add the tag to your Log without causing the Log to save and leave edit mode. [E] Tag Autosuggest alpha sort. We found large lists of results hard to use as they were cut off at 10. We added scrolling within Tag Autosuggest results for infinite lists, and we now make the lists alphabetical for easier scanning. [E] Carriage returns in Logs. We added SHIFT+ENTER function so you can add line breaks to log entries. You can also paste in content from other software and line breaks should be preserved. [E] Display Tag Legend. Your tag symbols and labels are now displayed above the Log entry form for easy reference and reminding of what tag labels you created. You can click on a symbol to add it to the Log entry you’re currently writing. On mobile, this will also make adding tags faster. [E] Updated help text. There’s help text below the Log entry form. I’m not sure how I feel about it as it seems to clutter the page a bit. But I think it’s helpful for new users. In this release we changed the text so it’s hopefully clearer. [E] New domain and server. We moved the Campaign Logger to campaign-logger.com and a new, faster web server. [E] Cancel button. You can now bail on creating a Log entry immediately by using the new cancel button. [E] Password change. You can now trigger a password change from campaign-logger.com. Before you would have to go to the Roleplaying Tips website, login there, and request a password change. Note: due to the domain change, you probably don’t have campaign-logger.com in your email whitelist or address book. So please look for password change request emails in your spam folder if you don’t see them in your inbox after 5 minutes. [B] Tags no longer case sensitive. In tag listing pages, Tags would be duplicated if spelled with multiple text casing in your logs. For example, @NPC and @Npc would show as two different Tags. We’ve now made Tags case insensitive to help clean up the tag listing pages and make finding log entries easier. [B] Campaign Log import. Overwriting Campaign Logs was not always clearing contents of the old file. This has been fixed. [B] Multiple date tag listings. If you used the % tag, which is reserved for in-game dates, then your dates would show under all three configurations in the date tag listing page (%12/20/2015, %20.12.2015, %2015-12-20). This has been fixed. Only one format shows – the format you selected as your preferred format. [B] Phrase tagging using asterisks. Reported by Tony. ‘[symbol]”tag goes here” method doesn’t work for the asterisk. *”Campaign Name: Session 1” won’t work.’ This has been fixed and you can use asterisk tags with phrase quotes. [B] Large file imports. Importing large JSON files was causing persistence problems in PHP. This issue has now been fixed. [B] Logger text sizing on Windows 10. Fixed a small bug that was causing fonts not to display properly on Win10. [B] Three item Tag lists not getting tagged. The following entry would result as the last item not being tagged properly: #”Blah’s 1″ #”Blah’s 2″ #”Blah’s 3″. Basically the third tagged item with an apostrophe would not show up as a link. This is now fixed. [B] Deleted items not disappearing. Due to slow server response, sometimes when you deleted a Log Entry it would not get removed from your screen for several moments. We moved the Campaign Logger to a new, faster, standalone server and so far reports indicate this issue has been fixed. [B] Renaming Campaign Logs caused instant re-sort. If you edited the name of a Campaign Log it would resort alphabetically with your other Campaign Logs as you were editing. This issue has been resolved. The re-sort now happens when you save your edits. Not a Campaign Logger user yet? It’s the game-changing GM organization and campaign management tool I’ve always dreamed of. Learn more about the Campaign Logger here.